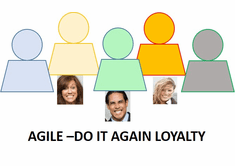 Do it Again for former SmartPath LLC's (SPL) Agile Certification Class trainees, a loyalty program. This is a 100% Live Online training using your computer. All classes are guaranteed to run at the time of purchase. Your class #: AS203. The new PMI-ACP exam begins 3/26/18. The new PMI-ACP exam started 3/26/17. Class times: 10 AM to 6:30 PM ET, unless otherwise stated. This schedule is the same as 7 AM to 3:30 PM in Pacific Time. SmartPath LLC is a Global Registered Education Provider* (R.E.P.) of PMI's R.E.P. Program, # 3441. Class Description: The class is taught over 3 days, and you will receive 21 contact hours for exam approval at the end of class. The training is focused on what you need to know in order to pass the PMI-ACP exam, although this same knowledge provides the skills you need to know to lead your Agile project. This class teaches scrum and 9 other methodologies. The PMI-ACP agile credential stands for PMI Certified Agile Practitioner (PMI-ACP)® credential. SmartPath LLC's Agile Workbook is included. No other materials are necessary. A free 30-Day PMI-ACP Online Quiz Practice Subscription is also included and starts on day one of class. This training price for "do it again" training does not include a 3rd exam pass guarantee. Training is aligned to the PMBOK Guide(R), Sixth Edition, and the PMI-ACP Exam Outline. Method of Training: 100% Live Online using your computer. These classes represent the industry's best practices for Agile. PMI Agile Certification training course with Exam Prep provides the 21 hours you need for Exam approval, as well as prepares you for PMI-ACP Exam. The PMI-ACP credential is a Project Management Institute credential. Call Nereda Haque, PMP if you have further questions, would like her to assess your Agile experience, or you prefer to purchase over the phone at 1-855-SMART50 or 360-584-8614. Passing: Passing is dependent on your ability to understand the class content and materials, and how a trainee applies this learning when they do their online quiz practice. Applying cognitive thinking, reasoning and logic while practicing is essential. Class # is AS203. See PDU Details Below if you are updating your PMI certifications. All training is aligned to the PMI-ACP Exam Outline. Note: The PDU or contact hour number is AS2O1-B starting for the dates May 24 to 26 class of 2017 going forward. If you took your Agile training prior to this date, then use AS201-A for PDU acceptance. (1) This class does not Include the PMI-ACP Exam or PMI® Membership. See See the main Agile page for these details. (3) This class is guaranteed to run at the time of purchase. (5) Free resitting for up to six months from the first day of training, either live video conference, onsite in DC or Bellevue WA. Onsite resitting is subject to available seats 2 days before training begins, otherwise you may resit Live Online. Email neredahaque@smartpathllc.com to request resitting. You will be notified prior to training whether or not you are onsite or Live. If you prefer Live then you won't get an email. Mention your resitting preference when you email. Thank you. (6) See all class guarantees. About the PMI-ACP Online Quiz Subscription. It is free for up to 30 days. We doubt you will need them past this time. Additional quiz practice resubscription or quiz extension: 30 days for $59, and 15 days for $39. 60 days is $79. How to purchase the class: All class dates shown are available for purchase. Onsite seats at SmartPath LLC in Washington DC are limited to 7 people and in Bellevue-Seattle are limited to 9 people. A few live online trainees or live online resitters may participate in the class. Please plan your training so you ensure that you have a seat. Click on the down arrow, then click on the dates you want, then click on "add to cart" and follow the menus. It is advisable to plan at least one to 3 months in advance. If you are awaiting organizational approval let us know so we can reserve you a seat temporarily. You may use either a credit card, or debit card, PayPal or choose pay later using PayPal in the “add to cart” menu. If you prefer you may purchase over the phone by calling 360-584-8614 or 1-855-SMART50.